The Wine Products Council (WPC) is a semi—governmental organisation governed by public law, with executive powers but ultimately responsible to the government, which finances all its activities. With the accession of Cyprus to the European Community in May 2004 the organisation has gained importance and is engaged in policy making and pursuing a dynamic role in serving the interests of the wine sector. The WPC operates under the supervision of the Ministry of Agriculture, Natural Resources and Environment. It is governed by a nine—member board appointed by the Council of Ministers. The WPC plays a fundamental role in the formation of policy and in overseeing the implementation of the Common Market Organisation of Wine and the spirit drinks regulations of E.U. b) To regulate plantations in vine growing areas, the type, variety or species of vine and to classify them according to their use. c) To maintain and manage the national reserve of planting and replanting rights, to approve and grant planting and replanting rights. d) To develop schemes related to the merger of small and fragmented vine plots, to enable economies of scale, to restructure convert and to ensue the abandonment of vineyards of lower quality wine-making varieties. e) To gather and process data related to the anticipated harvest, production, storage and circulation of vine and wine products. f) To manage and control the application of market mechanisms in accordance to the wine CMO (The common market organisation for wine). g) To define, implement, administer and control schemes and measures for the withdrawal, distillation, storage, disposal and specific use of vine—wine products and by-products. h) To examine and check books and records, commercial and other documents kept by wineries and distilleries, concerning the movement, production, storage and disposal of their products and by-products. i) To inspect matters related to the origin, designation, description, presentation and packaging of wine products and to take the necessary actions to protect the lawful interests of consumers and producers. j) To approve new demarcated regions as geographical indications – “regional wines” and “wines with appellation of origin”-, to determine the terms and criteria for the production and circulation of wines produced,classified and approved to use such indications. k) To produce and publish statistics and periodicals regarding the wine market. 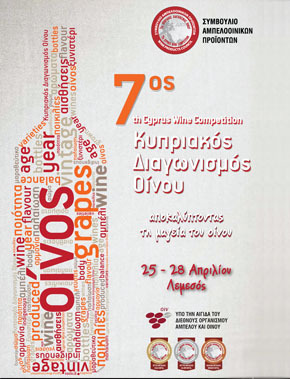 l) To promote and safeguard the interests of the Cyprus wine sector. m) To organize wine competitions. n) To undertake or outsource market research on wine products. o) To participate in the Wine Management Committee of the E.C, the International Organization of Vine and Wine and other international organizations and related activities.